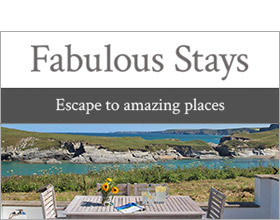 North Park is a luxurious farmhouse that can be found in Bude, Cornwall and is situated near the owner's working farm. The entire interior has been renovated into a contemporary holiday home with many attractive features and underfloor heating, which makes this home really exceptional. Step into the long sitting room with many comfortable places to sit and patio doors which lead out to the garden. And lovely countryside views right from you spot on the sofa. You can also enjoy the cosy woodburning stove and large TV to watch all your favourite shows, so you don't fall behind. Entering the open-plan kitchen and dining area, you will be greeted with large fitted kitchen, with wooden units and sleek black worktops and all the appliances you could possibly need. With a stunning sky blue dresser housing a variety of ornaments, this property has all you could need and more. Upstairs you will find one king-size bedroom with an en-suite shower room, one super king-size (zip and link beds), and one family room with a single and adult bunks, plenty of space to accommodate all types of groups. And lovely modern furniture to compliment the wooden doors. There is a separate family bathroom, and a ground floor shower room, where you can choose from an elegant freestanding bath, or a separate shower cubicle to prepare for your day in style. Externally, the property has access to a peaceful, secluded country cottage garden with a patio area and a table and chairs. With stunning views across the surrounding countryside fields, a lovely space to sit out and enjoy the afternoon sun as a family. Bude offers easy access to many local attractions, including The Milky Way Adventure. A theme park which offers many rides, shows and play area for your children to sink their teeth into - especially the famous death slides in the Time Warp. Fun for both parents and kids, take advantage of the 110,000 square feet of indoor and outdoor activities, a truly wonderful experience for the whole family. North Park is the ideal holiday spot for parents and their little ones. Three bedrooms: 1 x king-size double with en-suite shower, basin and WC, 1 x super king-size double (zip/link, can be twin on request) with TV and en-suite shower, basin and WC, 1 x family room with 1 single and 1 adult bunks. Bathroom with bath, basin and WC. Ground floor shower room with shower, basin and WC. Kitchen with dining area. Utility. Sitting room with woodburner.